It was almost midnight; Sister Catherine Labouré was asleep. She was only a novice of a few months' standing. 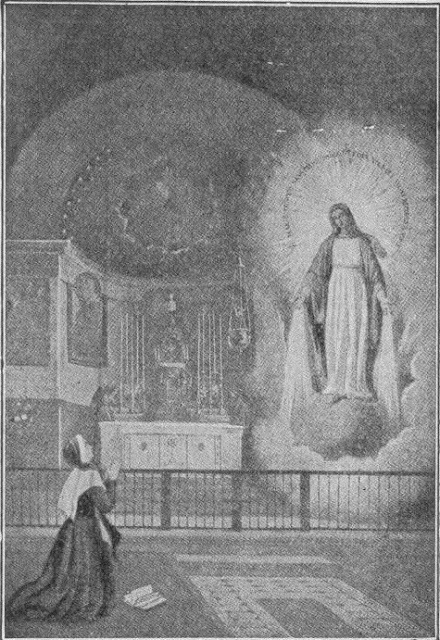 Almost every day of her novitiate, Sister Labouré had seen Christ visibly in the Blessed Sacrament. He appeared on Trinity Sunday crowned and in the robes of a King. At the Gospel of the Mass, the Cross was on His breast and His kingly garments fell to His feet. Sister Catherine was given to understand that this was a figure of what was about to happen to the King of France; he would be stripped of his office and power, and his scepter would pass to another. "Sister Labouré!" A shining angel stood beside her bed! By now he was urgent and insistent. Sister Labouré was dazed. "Come to the chapel, the Blessed Virgin Mary is waiting for you." Sister Labouré quickly recollected herself as best she could. "I might awaken the other Sisters if I get up." Sister Catherine Labouré dressed quickly. Out through the corridors and down the halls they went, the convent lamps lighted all the way, a condition not to be explained naturally. The Chapel door was locked as usual but at the touch of the angel it swung open. The Chapel, normally dark by night, was lighted brightly as if for Midnight Mass! Up the aisle they walked, the angel leading Sister Catherine. He stopped before the director's chair in the Sanctuary. Instinctively, Sister Catherine knelt. Nothing happened. In the strange silence of a supernatural experience, Catherine grew uneasy. The clock struck twelve. Sister Labouré saw no one. Presently there was the sound of rustling silk, and a very beautiful and majestic Lady walked down the altar steps and seated herself in the director's chair. 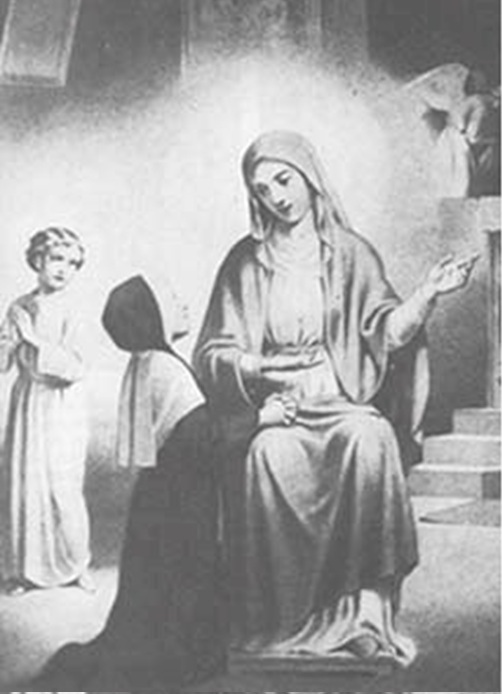 Sister Labouré knelt at the foot of the chair and talked with the Queen of Heaven for a long time. At first the conversation was personal: and then there was the message for the world. 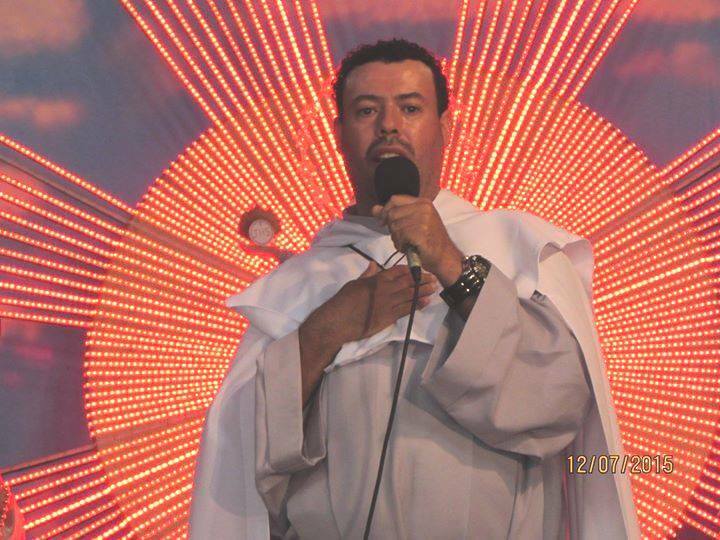 "My child, the Cross of Jesus will be hated, many priests will be put to death. "The Archbishop will die. The streets will run with blood. "My child, the whole world will be filled with trouble and sorrow. "My child, the good God wishes to give you a mission. Later I shall let you know what it is. You will have much to suffer. But do not be afraid. "The days are evil. Terrible things are going to happen in France. The King's throne will be overturned. The whole world will be filled with trouble of every kind. But come to the foot of this Altar often. Here many graces will be given to everyone who asks for them. They will be given to the rich and to the poor, the great and the lowly." The climax had been reached; the Blessed Virgin arose and left. A few months after her first visit to Rue de Bac, Our Lady was to pay her second visit to Sister Catherine Labouré. 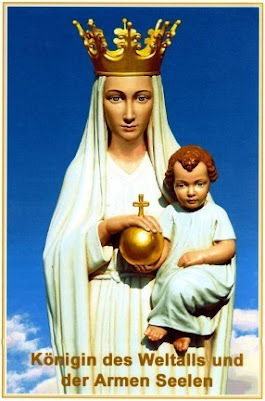 After the first fearsome message about the turn of events in France and the world, the Blessed Virgin, as always, was to propose a remedy and preventive measures. Eight days after her first visitation, the Freemasonic July Revolutions broke out in Paris as she had prophesied, but the trouble died out almost as quickly as it had begun, and Our Lady was to prepare now for the more serious troubles that would be more than a mere passing incident. It was not even to begin the week Our Lady spoke -- it had already begun in the French Revolution the century before, but now was becoming critical. The ever widening spiral of human affairs was to evolve into something of which Our Lady went on to speak, and to end finally in days which have not as yet come. They lay beyond Fatima, beyond the two world wars. 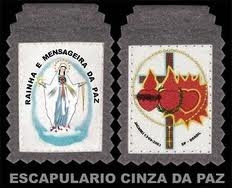 Their consummation was to see the promise of Fatima come true. 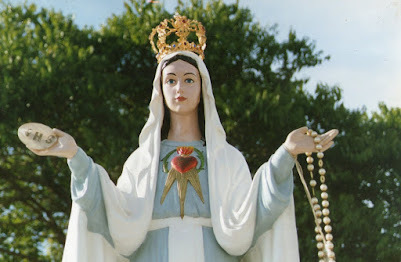 In their fulfillment all the messages of Our Lady were to become onemessage, terminating possibly before the year 1960, when the last part of the message of Fatima was to be made known. "My child, I have a mission to entrust to you. You will have to suffer much in the performance of it, but the thought that it will be for the glory of God will enable you to overcome all your trials. You will be opposed, but do not be afraid. Grace will be given you. Tell all that takes place within you with simplicity and confidence. You will see certain things; you will receive inspirations in prayer. Give an account of everything to him who has charge of your soul." St. Catherine then continues: "I then asked the Blessed Virgin what was the meaning of certain things which had been shown me." She answered: "My child, the times are evil, and misfortunes are about to overwhelm France. The throne will be destroyed and the whole world convulsed by all sorts of calamities." The Blessed Virgin looked very sad as she said this. "But," she added, "come to the foot of this altar. Here graces will be poured out on all who ask for them, great or small. There will come a time when the danger will be great and it will seem that all is lost. But have confidence. You will feel that I am with you and that God and St. Vincent are protecting the Communities. Have confidence, do not be discouraged, I shall be with you." 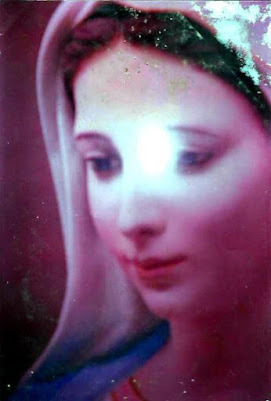 Then with tears in her eyes, Our Lady continued: "There will be victims in other Communities. There will be victims among the clergy of Paris. The Archbishop will die. My child, the Cross will be despised and trodden underfoot. Our Lord's side will be pierced anew; the streets will run with blood, and the whole world will be in sorrow." Unknown to Catherine, these words would bridge more than a century. That the Archbishop would die in about forty years time was revealed definitely to St. Catherine, but of the final climax, we have no way of knowing whether or not Catherine fully appreciated the words she was to pass on to mankind. The Archbishop died, as the message said, in the Paris Commune -- the first Communist revolution -- which took place in France in 1871. 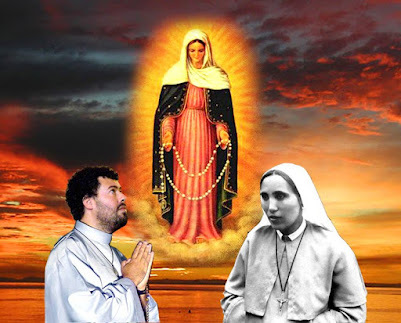 Mary was coming to crush the head of Communism long before it inundated the world from Russia, and she closed with the germ of Fatima: "My eyes are always watching you, I shall grant you many graces. Special graces will be given to all who ask for them, but people must pray." 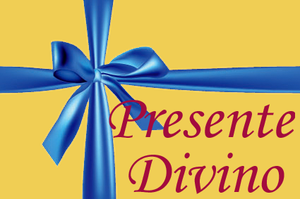 "You Will See Me No More..."
Saturday afternoon, November 27, 1830: the next day would be the First Sunday of Advent and the Sisters of Charity were making preparations for the coming of this great Christian Feast of the year. 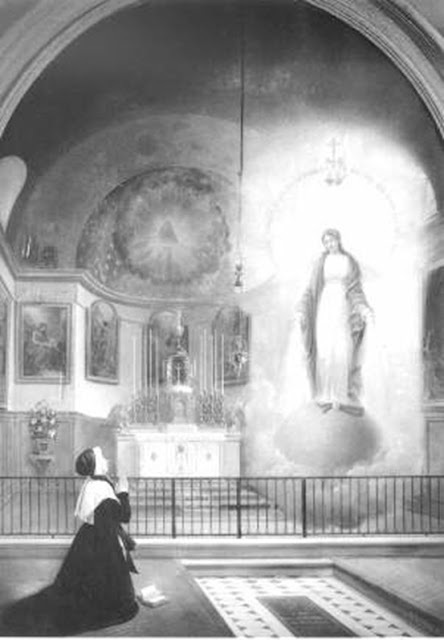 Sister Labouré was praying hard to know her mission, of which Our Lady had spoken on the first occasion. During her prayer she heard the same rustle of silk over St. Joseph's altar in the Chapel, and there stood the Blessed Virgin Mary clothed in white! She was standing on a globe, one foot crushing the head of a serpent on the top of the globe. In her hands she held a smaller orb, a golden one surmounted by a Cross, which represented the world. 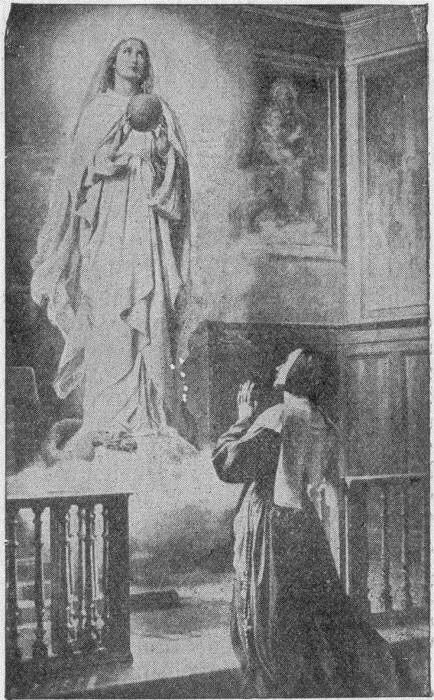 Our Lady was offering this to God, looking toward Heaven and praying for its acceptance by the Almighty. On her fingers were many rings, filled with jewels and precious stones, from which shining rays of light descended. "This orb which you see is the world, France in particular, and each person individually. I am praying for it and for everyone in the world. The rays which fall on this orb are the graces which I give to those who ask for them. But there are no rays from some of the stones. For many people fail to receive graces because they neglect to ask for them." 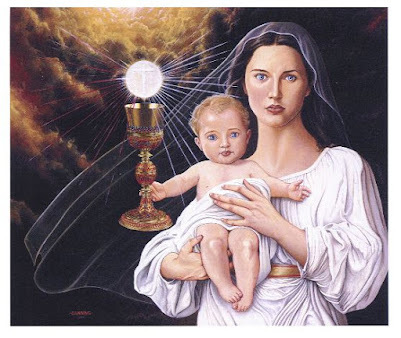 After a time the small orb representing the world in Our Lady's hands vanished and she lowered her arms outstretched, and the rays glittered and glistened more brilliantly than before. Around her Queenly head appeared the luminous letters of the words: "O Mary, conceived without sin, pray for us who have recourse to thee." A frame of gold appeared around the entire vision as Our Lady said, "Have a Medal struck after this model. 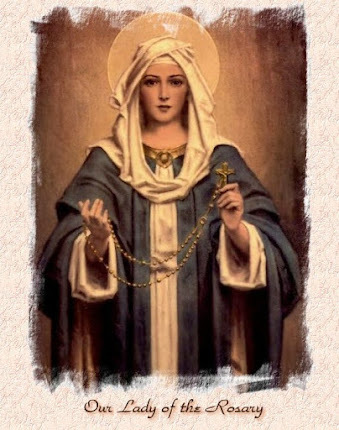 All who wear it will receive great graces; it should be worn around the neck. Great graces will be given to those who wear it with confidence." The apparition turned, revealing the model for the reverse side. This was a large "M", surmounted by a Cross on a bar. 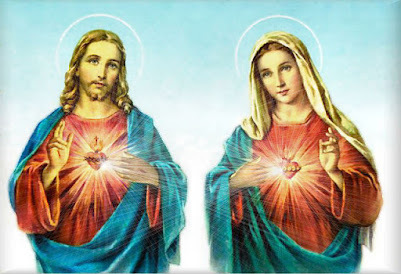 Below the "M" were two hearts, one encompassed with thorns, the Sacred Heart of Jesus, and the other pierced with a sword, the Immaculate Heart of Mary. Encircling the whole were twelve stars bordering the golden elliptical frame. The vision disappeared. It was repeated several times. The last time Our Lady said, "You will see me nor more, but you will hear my voice in your meditations." 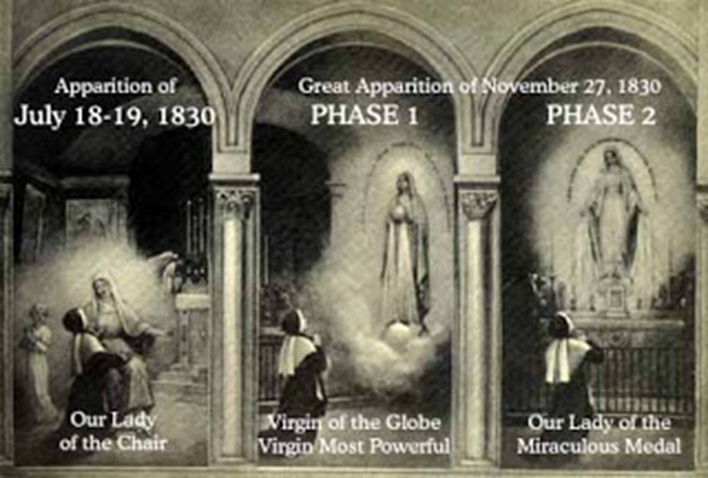 This was her first official herald, the Heaven-sent insignia of the modern Age of Mary. 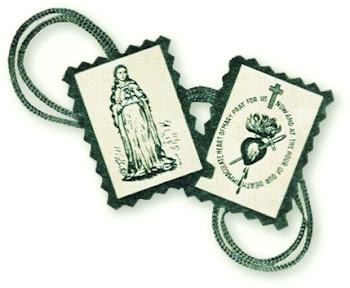 It was to be called the "Medal of the Immaculate Conception;" the prayer inscribed on it honored Our Lady's unique privilege: "O Mary, conceived without sin, pray for us who have recourse to Thee." It would prepare the world for the great declaration of a quarter of a century later when Pope Pius IX would declare the great dogma of the Immaculate Conception as an article of Faith, an essential element of Catholic belief. 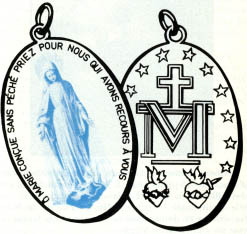 The Medals of the Immaculate Conception streamed from the presses by the millions. They overflowed France into the world beyond. Not long after, there was an epidemic in France. The death rate soared and medical science was unable to cope with the crisis. 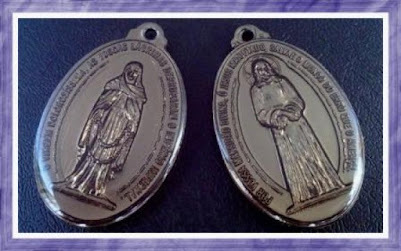 People turned to the Sisters of Charity who gave them the Medal of the Immaculate Conception with the assurance that great graces would be showered upon all who would wear it with confidence, especially if it were worn around the neck. After the first cures, people demanded it excitedly. The Archbishop of Paris found it efficacious to secure the return to the Church of an archbishop nearby, who repented on his deathbed. He died in the arms of his fellow prelate. 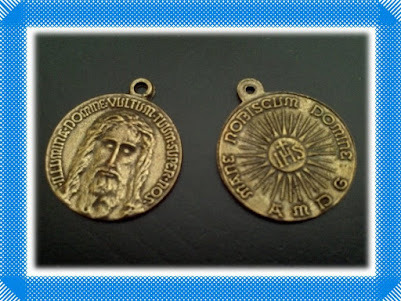 So many favors, cures, and conversions were effected through its instrumentality that its name and doctrinal significance were lost in the clamor; it became known simply as "The Miraculous Medal." 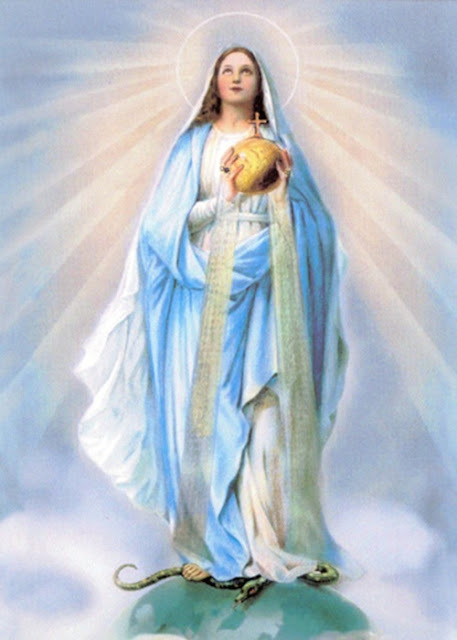 Virgin Mother of God, Mary Immaculate, we unite ourselves to thee under thy title of Our Lady of the Miraculous Medal. May this medal be for each one of us a sure sign of thy motherly affection for us, and a constant reminder of our filial duties to thee. While wearing it, may we be blessed by thy loving protection and preserved in the grace of thy Son. 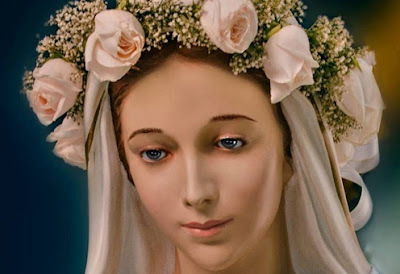 Most powerful Virgin, Mother of our Savior, keep us close to thee at every moment of our lives so that, like thee, we may live and act according to the teaching and example of thy Son. Obtain for us, thy children, the grace of a happy death, so that in union with thee, we may enjoy the happiness of Heaven forever. Amen.